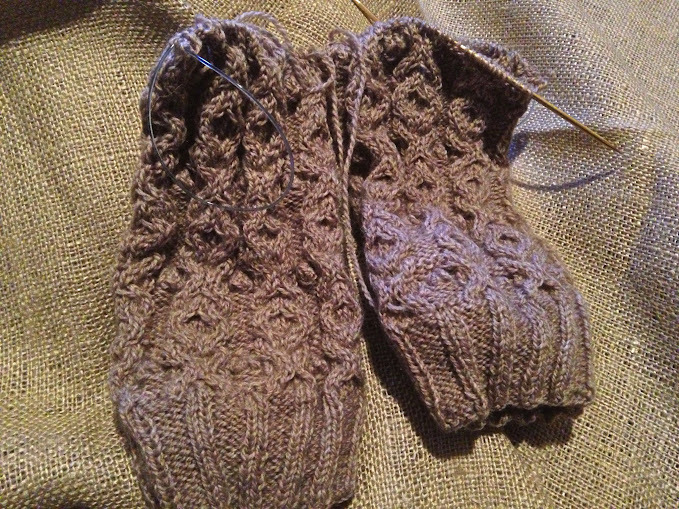 With the looking back, I also examined my knitting past, and longstanding WIPs. I think back to some projects I started about 9 years ago, when I first got into knitting before my many hiatuses. Nearly all of those were scarves, as I was far to scared to start anything A) in the round or B) with many colors. Granted, I was a 14 year-old and I would say I had other priorities other than knitting. But one of my Christmas presents was a blanket for my mom. Nine years later, it has progressed very little, sad to say. However, I am pleased to say that I brought it back with me from my visit to my parents’ house and intend on finishing it before I return to their house later this year. It’s an extremely basic garter stitch with two colors, constructed in squares to be sewn up. Here is the pattern. I’m currently working on my 23rd square. My goal is next weekend….I really think it’s possible.